As the mornings are feeling a bit more crisp, welcome the change in the season with the delicious flavors of fall! Pumpkin and cinnamon make such a wonderful pair, and these muffins are great to have on hand for breakfast, brunch or a delicious snack most anytime of day! Fill your home with the fragrance of fall with these spiced pumpkin muffins. Place cupcake/muffin liners in a muffin pan. In a large bowl, gently whisk dry ingredients (flour, baking powder, baking soda, salt, spices). Bake muffins 18-20 minutes (for standard sized muffins). Bake extra large muffins (as pictured) 25-28 minutes, or until a toothpick inserted in the center comes out with moist crumbs, but no wet batter. Feel free to make this recipe into Pumpkin bread instead of muffins. Divide batter between 3 standard sized loaf pans. Bake loaves (in greased and floured pans) for 50-55 minutes. This recipe makes a lot of muffins. Feel free to cut the recipe in half, or make some muffins and a loaf of bread. This recipe, along with one of my images, is featured in the beautiful fall issue of The Party Dress Magazine (on page 73). Prop note- I purchased the paper liners shown in this post from Sur La Table. Pumpkin and cinnamon go so well together.. Thank you for the recipe. That streusel on top sounds awesome!! Love this! 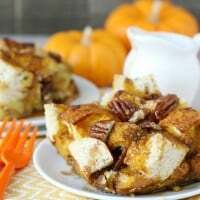 oh that looks like something I want to make, yummy fall treat! These would be perfect to enjoy on a crisp fall morning! I wish I had one this morning! It looks marvelous!!!! I am so ready to savor fall and enjoy pumpkin filled recipes. The muffins are just scrumptious! 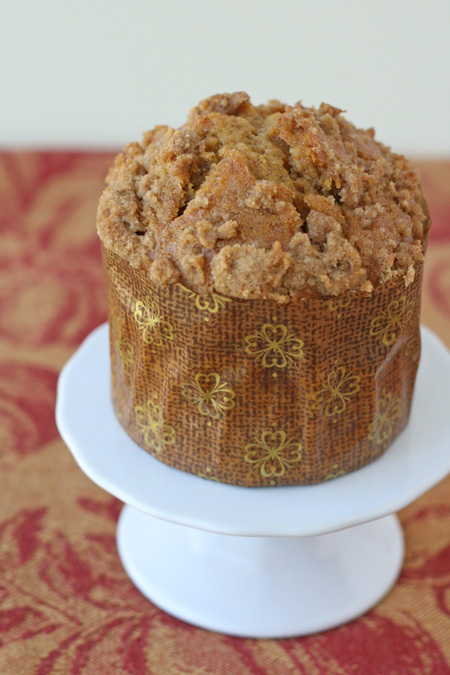 How can I resist the streusel topping and the warm spices of autumn? A seductive post! I cannot wait to try these! Maybe my toddler will even eat them – if she’s anything like her mama, she won’t be able to resist! Thanks for sharing! love that liners….where can I found them? Hi Julianna, I purchased the paper liners at Sur La Table (in store), but they can be bought on-line as well. I just updated the post to include the link. 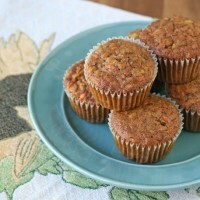 I love all the spices in these muffins! Your wrappers are adorable and the muffins look irresistible! How lovely would they be with a cup of hot coffee in the morning! 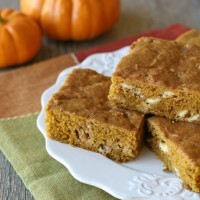 What a great use for my favorite ingredient – pumpkin! What’s better than pumpkin AND streusel? These muffins look amazing! Sound and look delicious. I’ve been looking for muffin baking cups like that for a while but can’t find – do you mind sharing where you got them from? They look great! Thanks! Hi Jenn, I purchased the paper liners at Sur La Table (in store), but they can be bought on-line as well. I just updated the post to include the link. Oooh, I can hardly wait to make these! I love pumpkin bread! Love you! Love these, Glory! I need to get a jumbo muffin tin! Unique combination of pumpkin and cinnamon in muffins. Great idea. So glad you gave the recipe a try and enjoyed it! 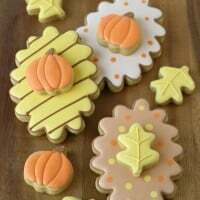 Happy fall baking! Looks like a really great recipe. We’re ready for all the yummy fall flavors around here! This looks delicious! Can’t wait to make them! Do you know if the muffins are able to be stored in the freezer? I’d love to eat some now, but keep the rest on hand for a later date. I have never frozen them, I usually share the exta’s with neighbors… but I imagine they would freeze quite well. Feel free to give it a try. Hi Glory can I substitute the pumpkin puree for bananas or apple puree? I have not tried it with any other puree, but feel free to experiment! 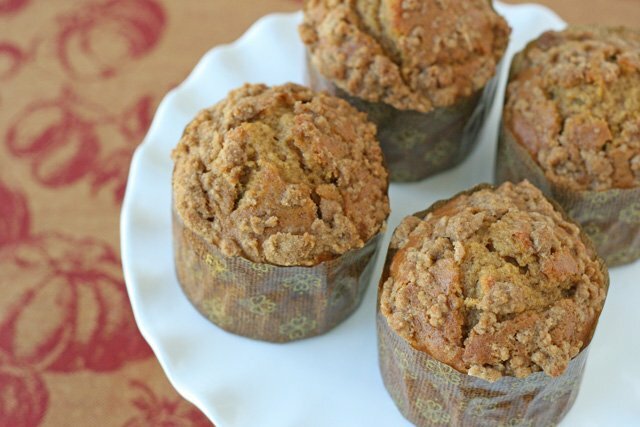 I am literally lying in bed wishing for…salivating over these muffins!! They look…GLORIOUS! I make your pumpkin muffins all the time and get rave reviews . Can’t wait to try this muffin recipe too! These turned out perfectly what a great way to start fall. Mixed some baked pumpkin seeds into the streusel and injected them with a bit of sweet cream cheese frosting for a dressier muffin. How glorious! I just made this. I cut the recipe in half and it only made 16 regular muffins. It must already be cut in half. They smell wonderful. I can’t wait till they get out of the oven. Hmm…. I’m usually pretty careful, but I will say that when I made these I made some large cupcakes, some standard sized, and one loaf of bread… so I had to make a bit of a guess as to the yield if someone were to make only one of those sizes. I may take a look and adjust the expected yield. Thanks for your imput, I hope you enjoy them! Just wanted to let u know I tried them out and they were a hit with the family. Kids really enjoyed them(did not even wait for them to cool!). Unfortunately, here,in South Africa,we do not get tinned pumpkin.Nevertheless, I made my own pumpkin puree. Once again, thanx for sharing! Made these today and they are SOOOO yummy! I can’t stop eating them! I just pulled out my 3rd batch of these muffins this week! The 2nd & 3rd were half recipes, made 17 muffins apiece. I am using 1/2 whole wheat flour & can’t tell the difference! Delicious recipe!!! Hi, this is the 3rd recipe that i’ve tried from your site this month and they were all really good. I’m just curious on how do you get those cracks on the top of the muffin. Hi Jenny, So glad you’re enjoying my recipes! The cracks on top are just the way the muffins bake up for me. Try to make sure to not over-mix the batter once all the ingredients are added. Happy baking! Just made these tonight and they were terrific! 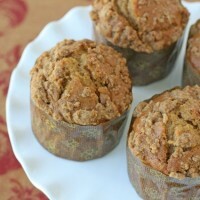 I substituted apple cider for the water and added both walnuts and pecans to the streusel. So glad I found this recipe and I’ll definitely make these again! I made these for last night’s diner, perfect with coffee, not too sweet. Light, fluffy, just the right amount of spice for my taste. I will be making these over and over again! I cut the sugar down to only 1.5 cups; I even got comments on how good these were because they weren’t too sweet, so I think I made the right choice there. I might try reducing it a little more next time to see how low I can go. I did increase the streusel topping a bit because this wasn’t quite enough to cover all 30 muffins. Also, these took longer than stated to cook. I made regular sized muffins and they took 23 minutes for me. But they were delicious and easy, so I will definitely make them again.